quite, so I am still taking things easy. Your autumn leaves inspired tag is gorgeous. The various elements you used make it unique. I love how you trimmed it off, too. Someone suggested they would see your lovely moon shot from the other night in a digital entry, and there it is. 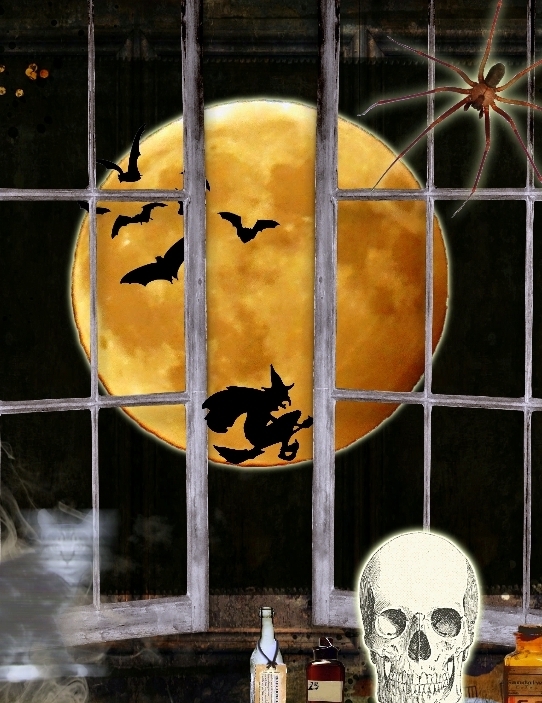 It's a scary night with witches, bats, and skeletons just begging to scare us. It's great. That crow is living dangerously. I've seen crows in parking lots, but never see them near my home. I guess they go where the food is. All the photos are beautiful, including the latest moon shots. Hope you are having a great day, and so glad to read you are nearly feeling yourself again. dein Tag ist wunderschön mit diesen herbstlichen Farben und Blätter. Ich bin begeistert von dienem Journal zu meinem Thema das ist die Zeit der Mystische Landschaft in der Seele und ich finds es wunderbar!!! Danke dass du mit gemacht hast wieder bei AJJ! wunderschön ist dein herbsttag und deine seite ist toll. What a fantastic Sunday post full to the brim with wonderful art and photos! Happy Sunday and thanks a lot for supporting Elke's theme so well this month again! Much appreciated! Such a beautiful tag. Those red leaves really pop. 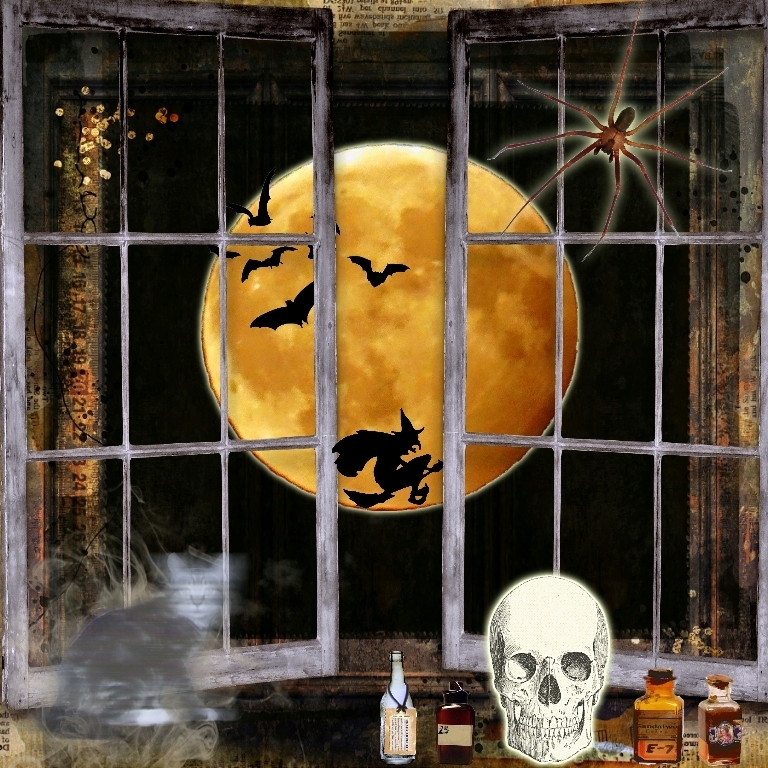 Your Halloween page made me smile especially the witch riding across the moon. You must have had rain as the cows are lying down in the fields and the Fraktur house and flowers is so pretty. Great work and lovely photos. Lovey autumn tag, glad you are on the mend. Spooky moon page and the raven's quite seasonal with his black colour. Lovely photos. Beautiful Autumn and Halloween pieces. The moon images are stunning! A bit Halloween like. I love how the raven is walking on the rails. What great balance he has! Herrlich dieses leuchtende Herbst-Tag mit dem frischen Laub darauf. Aber deine Spuky-Seite sieht auch wieder ganz klasse aus, so richtig gruselig. Auch die Fotos sind wieder schön, was der Rabe da wohl so Alles findet? Marvellous Hallowe'en art. I love those brown sheep photos. A beautiful Autumn tag, and I love the sheep!! What gorgeous seasonal art! I love this time of year and it's wonderful to see your beautiful art. Your photos are lovely too, the lambs are so cute. LOVE THE TAG!!! It's been a while since I've been around the blogland. Missed all your stunning art and photography. Its a fabulous autumn tag, I love the colours and the natural details you added. Your Halloween page looks awesome, I like the way you used one of your own photos. a great project. Hope your Sunday has been a good one. Wonderful tag with a stunning background and wonderful hedgerow embellies. They make it look so autumnal! The digital piece looks amazing too and the photos are wonderful like always. The moon looks amazing! Fall is my favorite time of year- so I love the TAG. So gorgeous. The Moon in the Window is brilliant. I adore it. Your photos are also fabulous. What cool shots of the moon. :) Fantastic! A wonderful tag and I love your digital piece. I’m glad that you’re feeling better and are almost back to normal. Have a good day. Glad you are on the mend and having fun with your girlfriends. I love getting together with friends. It always makes the world feel like a happier place. Your autumn tag is incredibly beautiful and much nicer than anything I can buy at the shops. You are so creative. I love the landscape of the soul pic too although the spider will give me nightmares! Everything about this post is gorgeous from the moon photos to the lambs and the crow. Thanks so much for sharing. Happy Autumn! Hi Valerie! Thanks so much for stopping by my blog! I really love and appreciate your visits! And WOW! I absolutely LOVE your gorgeous fall tag and Halloween work of art for AJJ! They are spectacular. I particularly enjoyed seeing your amazing photos, too. That full moon - WOW! Thanks again for your friendship!!! HUGS! Lovely Autumnal tag and great Halloween art. Love the warm colours in the tag and really like the imagery of the Halloween piece. Your tag is just gorgeous! I love Lavinia's stamps! The coloring of this- pure Autumn! Your moon photos are always so perfect! You must have the best zoom lens ever!! These are awesome! Love the fall tag ♥ We won't be having much fall colors here because of the drought again. We did get some rain late last week and over the weekend but I think it was too late for the colors to develop . Many trees are already losing their leaves with out any color to them :( THe Halloween art is great too. Love all of the photos you shared again. Wow. I can't believe those leaves are real! They look so colorful and glossy they could be fake. Fabulous tag! Your photos are a terrific match for your art! The designs are such fun and very autumnal! I'm glad you're almost back to normal! Happy you had a good time out with friends! I love your leaf tag and I love your Halloween piece! So cool! Amazing moon pics and I love the animal pictures! Big Hugs! Dein Tag gefällt mir sehr gut! Wunderbare Farben und die Blätter sehen toll aus. Danke noch einmal fürs Mitmachen bei der Oktober Challenge bei Country View Challenges!